To increase operator comfort and convenience, all PC390LCi-11 machines come standard with the machine-control-enhanced joysticks first introduced on the PC210LCi-11. 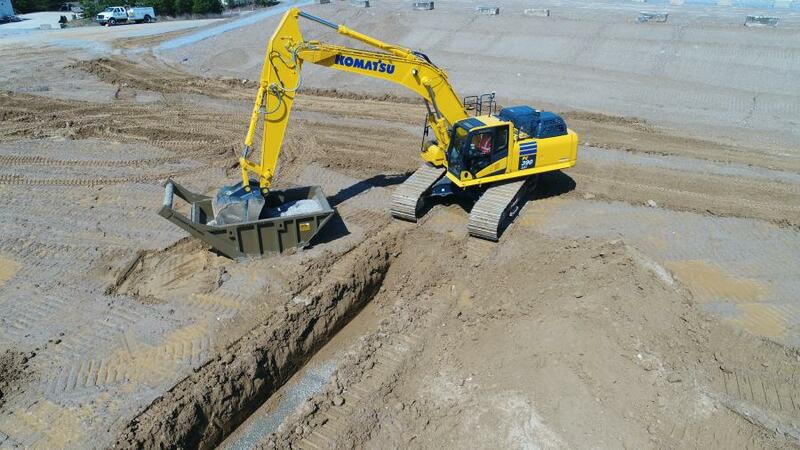 Komatsu America Corp. introduced the PC390LCi-11 hydraulic excavator, the first 3D semi-automatic excavator available with the nimbleness and speed of the popular 36-ton (32.6 t) weight class machines and stability of much larger machines, according to the manufacturer. Intelligent Machine Control features a unique sensor package, including stroke sensing hydraulic cylinders, an IMU sensor and GNSS antennas. The machine utilizes 3D design data loaded into the machine's monitor to accurately display machine position relative to target grade. When the bucket reaches the target surface, automation kicks in to limit over excavation. Intelligent Machine Control Joysticks — semi-auto/manual mode-switching and design surface offset function can be operated with switches on the control levers. Auto Grade Assist — as the operator moves the arm, the boom adjusts the bucket height automatically, tracing the target surface and minimizing digging too deep. Auto Stop Control — during boom and bucket operation, the work equipment automatically stops when the bucket edge reaches the design surface, thus minimizing design surface damage. Minimum Distance Control — the machine controls the bucket by automatically selecting the point on the bucket closest to the target surface. If the machine is not facing a sloped surface at a right angle, it will still follow the target surface and minimize digging below it. Facing Angle Compass — the orientation of the facing angle compass' arrow shows the operator the facing angle, relative to target surface. This allows the bucket edge to be accurately positioned square with the target surface. Realistic 3D Display — the machine and design surfaces are shown in realistic 3D. The angle and magnification of the views can be changed, allowing the operator to select the optimum view, depending on work conditions. Control Box — the Intelligent Machine Control monitor uses a large 12.1 screen for visibility and ease of use. The simple screen layout displays the necessary information in an easily understood fashion. A touch screen icon interface, instead of a multi-step menu, simplifies operation. KOMTRAX level 5 technology feeds the operator machine data, such as fuel and diesel exhaust fluid (DEF) levels, Komatsu diesel particulate filter (DPF), regeneration status, location, cautions and maintenance alert information. The PC390LCi-11 excavator, whether rented, leased or purchased, is covered by the Komatsu CARE complimentary maintenance program for the first three years or 2,000 hours, whichever comes first. Komatsu CARE includes scheduled factory maintenance, a 50-point inspection at each service and up to two complimentary Komatsu DPF exchanges and up to two DEF tank flushes in the first five years.